We should be aware of the fact that where you find megacities you often also find high biodiversity. Consequently, when talking about biodiversity, we cannot exclude cities as they often coincide with biological hotspots. Of course, the green spaces in cities do not only serve the purpose of biodiversity but they are also used by people for recreation. Urban greens are areas of human comfort. But how to balance between human comfort and biodiversity? 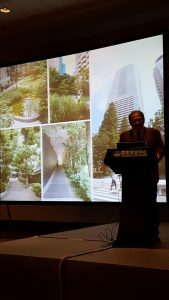 One way of achieving this balance in Tokyo is the inclusion of secondary forest, called satoyma in Japanese, into the city green space. At the foot of many skyscrapers satoyama-type forest patches and greens have been introduced in order to increase biodiversity. In such projects native species which used to dominate the area before major urban development occurred have been invited, while the use of introduced and horticultural species has strictly been prohibited. However, there is need to reconsider the term “native” species. By definition, these are species naturally growing in a particular area and indispensable for conserving vernacular landscapes. But do “native” species always stay the same? We have to take changes of the environment including the climate into consideration. In Tokyo, for example, the average temperature has sharply risen from 13.6 °C in the early 1900s to over 17.0°C today, mainly due to the heat accumulation in the city center. By having such changes we may have to understand that species which used to be “native” in former days are no longer so. So Tokyo is now becoming an ideal habitat for species introduced from southern Japan and even tropical regions. This example shows that it is impossible to recover historical ecosystems. Species growing under the new environmental conditions need to be taken into account as “neo-native” species. This is why we must relativize the concept of “native” species! In addition, we should also redefine “nature” in the city. Instead of having the one set reference, it is more appropriate to have anadaptive reference that goes along with the changes that take place.